I started feeling contractions at 7am on Sunday, June 3rd. They were not consistent and felt like menstrual cramps. I even doubted that I was actually in labor because they came so infrequently and felt so light. I stayed in bed for a few minutes and then decided to go ahead, get up and dressed. My son was still asleep and my husband was at work. I did my morning bible study and ate breakfast. The contractions still were not coming very consistently and I now thought for sure that I was mistaken. But, over the next hour they started to shape up into a normal pattern at about 5 minutes apart. I went ahead and called my midwife and doula just to let them know that I was in labor so they could organize their day. I also called my sister but did not want anyone over until things were much further along. When my husband called a little while later from work I also informed him but told him to stay at work but keep calling every half hour. I really just wanted to be alone and take things slow. My son woke up around 9am so I got him in front of the TV and got him some breakfast. He was happy to sit and did not bother me much so I could focus on my contractions. Around 10am I started to pace back and forth in the kitchen during contractions but they were still manageable on my own. About an hour later I started using the birth ball and just lay over it and sway back and forth. My sister arrived at noon and played with my son and started getting things around the apartment prepared. I decided that I wanted my husband to come home and my doula to head over shortly after. My husband was planning on doing some activities with my son so neither had to be too involved (which we both agreed on). Contractions starting coming a little closer together and more intensely. I decided to get into our garden tub and was much happier when I did. I rhythmically pours water over my stomach and was managing well. My doula arrived around 1pm and just sat with me by the tub. We talked in between contractions and I tried my best to stay in the moment when I was not having a contraction. This went on for a while longer but then my contractions really started to pick up. My husband finally arrived at home and he sat beside the tub and we talked for a while. Again, contractions started to change. I had to start swaying my hips to cope. This went from sway my hip on my back, to moving my whole body on my hand and knees. My sister and husband and been setting up the birth pool in the living room but I wanted to save moving until I couldn’t take it any longer in the tub. I decided it was time to call my midwifes and shortly after that they both arrived. Everyone (except my husband and son) gathered in the bathroom and closest and talked, monitored the baby, and wrote down stats. I finally decided it was time to move to the pool. I was afraid that it would not be warm enough or would be a let down in some way but what a great resource it was. It was soft and cushy, big and the water was hot. A few times someone did have to add more hot water to keep the temperature up but it was not often and not difficult. I tried a lot of different things in the pool. I started on my back and just sway my hips and legs loosely in the water. I turned at one point and rested over the edge of the pool wall. I occasionally got support from helping hands to allow me to let go and just relax my body. The contractions were very intense at this point and I had to groan louder and louder to relieve the stress building up in my body. The moans and groans are not as much about pain but more a way of coping and focusing energy in another way. To an outsider I could imagine I sounded in a lot of pain (and I was) but the groaning was a release and not a cry for help. This is where things start to get weird. I started to feel pressure and believed it was time to start pushing. I gentle started to bear down with contractions but still continued to be vocal. Eventually my pushes became more concentrated and I kept quiet. I kept asking my midwife if I was doing it right and expressed my wish for continual reassurance. She said I was doing fine and thought that my water had broken, though I did not feel anything. After a while with no change I started getting scared. I asked my midwife to check me and she said that I was only 8 cm and my water was still intact. I was really upset and started to panic. I had a fear that this process would never end. I stopped pushing and tried to get back into a rhythm of dealing with contractions but my head was not in it. I started getting frustrated with nothing working anymore. I believe this is because the relief of pushing is so great that when you are forced to go back to not pushing and letting the contractions come over you again, it now seems too much to bear. My sister convinced me to get out of the tub and stand with contractions in hopes that it might speed things up. I reluctantly did this and swayed a few contraction with my doula all the while crying and saying I was done. Everyone was trying to encourage me and calm me down but my brain was no longer accepting rational though processes. I had entered into full panic mode. My midwife insisted I lay down and rest which just seemed like an horrible idea since I knew that the contractions would be worse lying down but I finally moved to the bed. I was so unhappy and could not relax or find relief. She reluctantly offered to break my water to see if that would speed things along but I was scared of the increased pain. At this point my sister asked everyone to leave us alone and she was able to talk me into trying this as a last resort. Heather came back in and ruptured my membranes (which were clear) and I decided to get into the bathtub again. This did not work as I had hoped. I was wanting fresh hot water to soak in but the hardness of the tub in comparison to the pool and the small area did not give me comfort and again I found myself frustrated and wanting to be done with the pain. I began to beg for the hospital in hopes of pain management because the urge to push was overwhelming. The transfer request was also born out of the fear that if I did not stop pushing soon, I would end up in the same situation as last time. My thought process was that the sooner I got an epidural and stopped pushing the better chance I had for a vaginal delivery. Although I know they wanted me to stay, everyone agreed and made arrangement for me to be transferred into the care of Dr. Jennifer Meadows at Cedar Park Regional Medical Center right across the street. Dr. Meadows agreed to give me a fair trial for a VBAC and not rush to C-section unless necessary. My sister, myself and Heather loaded into my car and Ruth followed in her vehicle. My husband followed a few minutes later. Moment later (and after running a red light at my insistence) we arrived at the hospital. As with my first experience, relief was not quick. I registered at the front desk and was taken to my room. An IV was started, blood drawn (both which caused huge bruises that lasted weeks) and a monitor was put on. I asked for IV pain medicine as soon as I could get it. I did get something after being at the hospital for about 20 minutes but this just made me sleepy but did nothing for the pain. I was having trouble not pushing and stilled feared a repeat of my last birth. The nurse checked me and said I was still 8cm and my cervix was swelling from the pressure. The doctor had not arrived and I was not going to be given an epidural until half of a very large bag of IV fluid was given. The bag was draining slow and I just kept staring at it hoping it would empty quicker. I kept pleading for the epidural but was just reminded that only after the bag was half empty and the doctor arrived to check me. Finally the doctor arrived and after she got settled in, she examined me and said that I could start pushing. I was expecting to go on in labor for hours and here she was telling me that I finally had permission to push (while for the last 45 minutes I had been told not to). My legs went up and back and I gave my first push. I was told to stop as the baby was coming down fast. The doctor put a plastic bag under me to catch the fluid (etc.) and got ready herself. I pushed for about 3 contractions and Aaron was born. The pain was not much and the relief was great. I was so happy it was over and so relieved to not have had a repeat C-section. I held my baby but could not get a good look because I was still flat on my back. I had a small tear in my perineum so the doctor started the process of repair. This took another 20 to 30 minutes. During this time, after I had held Aaron for a few minutes, they weighted him and cleaned him up a few feet away. I spent my first night in the hospital alone with just my new baby boy and I liked it. It was quiet and I could rest and look at my son without interruption. 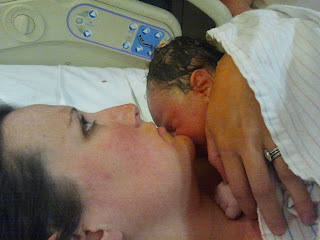 This was to be my only good night in the hospital as the pain of childbirth kicked in the next morning. I was not prepared for the pain of swelling and stitches and a myriad of other postpartum woes. My mother came to stay with me for the duration of my stay, and I could not have done it without her. She took care of me and my baby. My husband had to stay home to tend to our other son but came by twice a day to visit. Aaron ended up needing photo therapy treatment for jaundice (not sure if it was entirely necessary, but who knows) which my first son also needed. We stayed until Thursday and finally he was released. We headed home and no place was more desired. I was at least with my family again and could start the process of recovery and our new life as a family of four. Looking back, my experience, while not ideal, was still worth it and just like my first experience, the lessons learned are worth the pain. I cannot wish it had been different because I know in all things God is in control and He sees things we do not. I am blessed to have been able to experience the natural vaginal birth I wanted and to have a wonderful group of people to support me from beginning to end. The power or support is immeasurable so my wish is to be able to be that support for others in the future and encourage others to be supportive of birthing woman in their experience of having babies. « Kegal Exercises: Are they really necessary? This is a beautiful recounting. Honest and raw. I love the photos.